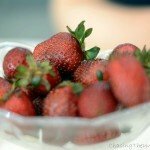 Solo female travel in Iran, is it a good idea? Is it safe for women to travel to Iran? 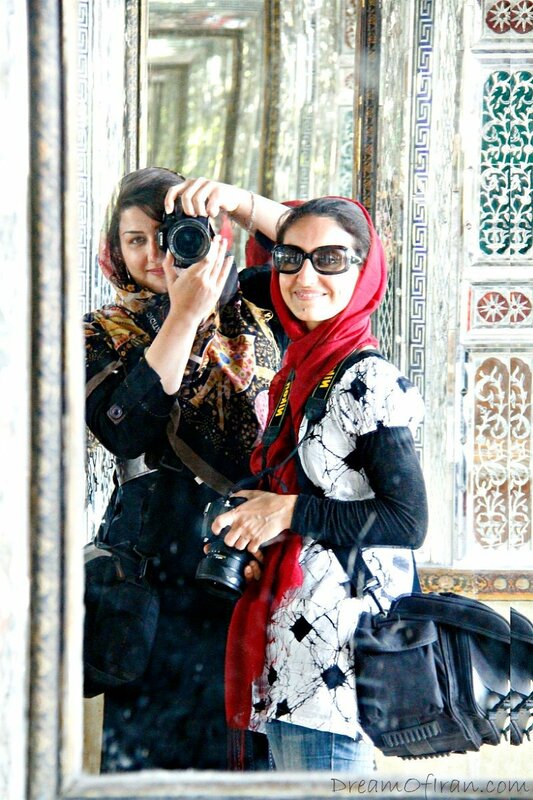 I decided to plan my Iran trip together with my friend Madi, an Iranian woman traveler whose family had no problems in letting her travel around Iran with the only company of another woman, to discover the wonders modern Persia was hiding and to bust the myth of Iran as a dangerous travel destination. If you are traveling independently, planning a trip to Iran has finally become easy. Through 1stQuest, the first Iranian agency to accept online payments, you can book domestic flights, book local buses online and apply for Iran visa with your Visa or Mastercard. Part of the documents required to apply for the visa is the travel insurance. You can by one pretty cheap on 1stQuest website starting from as little as 15 euro. Click here for more information on how to do it and the price. 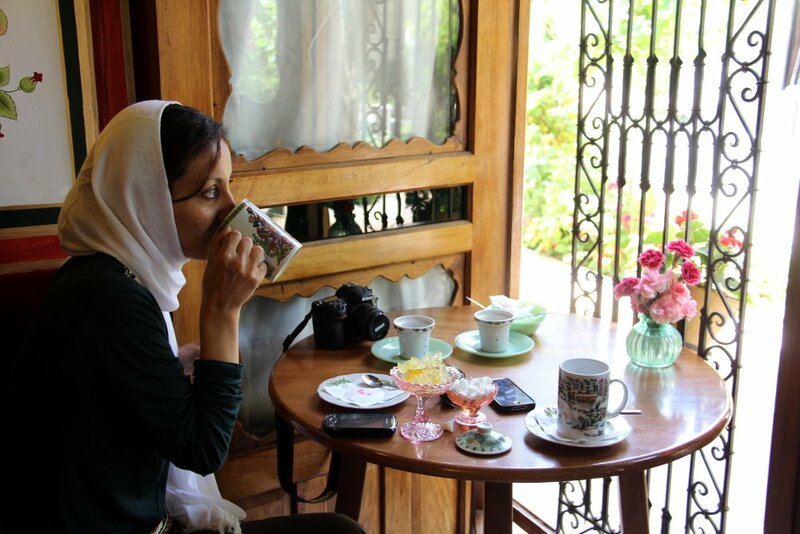 Enjoying my cup of tea at Firouz Cafe in Isfahan. While this is not the only inaccurate, if not downright false, information, it’s what most captured my attention in the article. Not only are most women I know pretty independent, but solo female travel in Iran is a rather common reality. Madi taking our picture and myself thinking it will never come up good. And it did! During my two-week trip to Iran, in every city, I saw women alone, in groups of women only or with other men, either family or friends, students or professionals, relaxing in parks, shopping, going to work or school, and busy pretty much in all routine activities you can think of. In the span of two weeks, we have visited many cities, and most trips involved buses and trains, both day and night ones. Obviously, we were not the only women traveling alone, in fact, we met and chatted with many women traveling solo on night trains and buses because not only this is a very common practice in Iran, but it’s also very safe. This trend of giving a bad image to Iran without any kind of knowledge is becoming truly boring and tiresome, as well as old and too much of a cliché. Moving onto something more interesting and useful, my recent trip to Iran saw two travel writers/bloggers/photographers (my friend Madi and myself) exploring some of the main cities and attractions, such as Isfahan, Shiraz, Persepolis and Yazd, and some more offbeat destinations, such as Lahijan and Talysh in northern Gilan province, from all of which I will be duly posting both words and images. Needless to say, my personal experience of female travel in Iran was richer than traveling solo as being with an Iranian woman, all our steps were filled with those insights only a local can come up with. Each of those extra pieces of information made me realize how close and similar Iranians are to Italians, both in the good aspects such as warmth and genuine sense of hospitality, in the bad ones, such as confusion and delays, and in the odd ones, like the overall carefree attitude and very personal interpretation of rules and laws. It was probably these constant and repeated comparisons that made of laughing and giggling the main features of our journey. My southern Italian/Sardinian look made everybody mistake me for an Iranian, asking me for directions or just striking a conversation with me, obviously until they understood that, apart for some three words, I don’t speak Persian. English is seldom spoken, this is why I would recommend booking a tour guide. All places we’ve been to are rather laid-back, with Shiraz being probably the most relaxed, maybe due to the fact that it’s considered the capital of poetry and romance in the country rather than its business hub, so it needs to live up to the expectations. 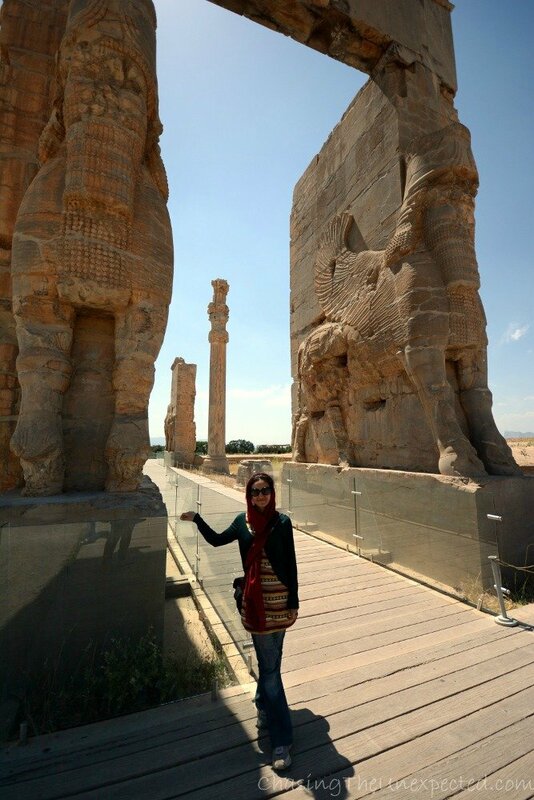 In front of some of the imposing sculptures of wonderful Persepolis, a must for anyone traveling to Iran. I started yearning for this trip long before departure. 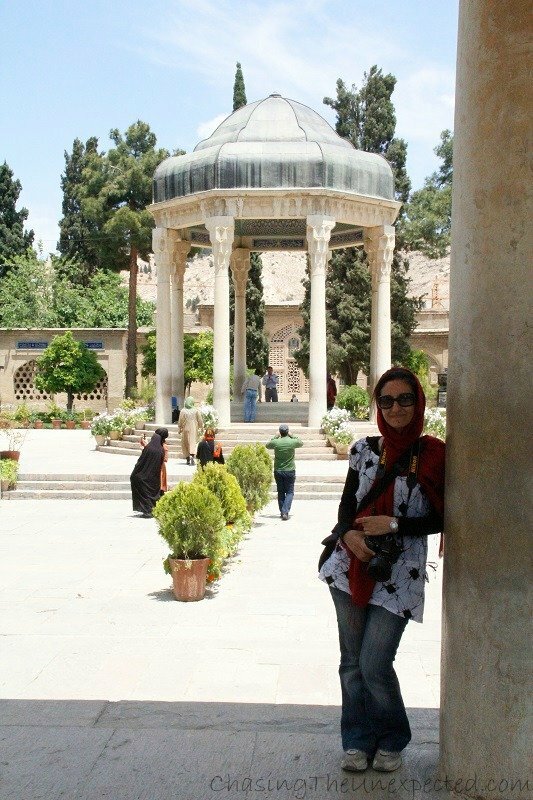 When I was planning my Iran trip, I was hoping to enjoy some much needed relax, a break from work and Rome, and couldn’t wait to start this carefree and laid-back journey. My preparation process revealed already some pretty serious resolutions, involving laptop, notepad, camera and four lenses (I know, heavy as hell, my back is still not talking to me). Even though wishing for a relaxing Iran trip, deep down in my mind I knew it was just this, wishful thinking. Instead, overall, my Iran trip felt like a roller coaster, involving hectic jumping on and off buses, trains, taxis and even one Iranair flight, visiting as much as we could, barely stopping for lunch and dinner, tucking into sweets and nuts, drinking fruit juices, detoxing with local Khakeshir, hardly sleeping an average of four hours per night for two weeks, and laughing out loud all the way from day one, as Madi recalled in her post Chasing The Dream: Two Women Traveling in Iran. This trip was exhausting and soothing at the same time, but most of all, it was inspiring, giving a new spark my own passion for history, culture and, not least, travel blogging. The tour was definitely one of a kind, and I’ll do my best to reproduce the same atmosphere and make you sense the same vibe we felt all along the way. Quelle description interessante de ton voyage! Et que dire des photos?! Che meraviglia l’Iran! Peccato non sia molto pubblicizzato dalla stampa italiana. Vedo che i giornali francesi ne parlano molto bene e danno spazio ai commenti dei turisti entusiasti della loro esperienza iraniana. La stampa italiana purtroppo è scritta in gran parte da ignoranti e corrotti, è ovvio che scrivano solo quello che i loro padroni ordino. E’ patetico. Oui Domenico, et beaucoup de ces touristes affirment qu’une femme en Iran est plus en sécurité qu’à Paris quand elle sort. Ils inventent ? Bien sur que non, les touristes français ont raison! Thank you so much Angela for sharing your experience. It’s so easy to believe what an article says without not really know how true that might be, that’s why it’s great you told us you personal experience. I keep hearing beautiful things about Iran and how incredible it is, I should really pack and go to see it with my own eyes! Exactly, and this is why people are always more relying on blogs rather than mainstream media. Traveling is easy now, potentially everybody is able to verify that media are just not telling the truth. Iran is an absolute must, great country, full of history, art and traditions, and great people who can really make you feel at home! I’m fascinated with Iran! I really, REALLY want to make a trip to Iran in the near future. Of course this always shocks people when I mention it. I think it was really great that you were able to travel with an Iranian woman. I think when I go I’ll most likely book a tour as I also speak no Persian! If you ever happen to come to Tehran I’d be more than happy to help you around. I’m an electrical engineer and a photographer and very very eager to help people around the globe know my country better. I was born and raised in the US and unfortunately I have first-handedly experienced what mass media feeds people in western countries about Iran and Iranian people. I recently met another woman who had traveled alone through Iran and she echoed your sentiment. I don’t know if I’d get to Iran anytime soon, but I definitely won’t rule it out. Apart from being safe, it’s definitely a very interesting travel destination. The only reason to book a tour is the language, which is quite hard to grasp if you haven’t studied it before, but for the rest, people are very friendly and always available to help. I am an Iranian working in France. The french peapels saied me Iranian peopels are our eslave. And you what do you think ? In all honesty, I think that what you are saying is not true. I’ve lived in Europe most of my life, traveled extensively around the Continent, especially France as half of my family is French, and I’ve never heard such absurdity anywhere, about Iranians nor about any other nationality. I’m sure you’ll love Italy, Italians and Iranians are very much alike, maybe that’s why I felt comfortable in Iran! 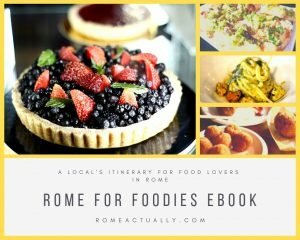 I’ve done quite a tour, so I’ll be posting a lot of photos and posts :) Do let me know if you happen in Rome, I’ll be happy to show you around! Concordo, l’Iran ha sicuramente problemi, che gli Iraniani sono i primi a riconoscere e come tra l’altro hanno tutti i paesi del mondo. Ho viaggiato molto e il paese perfetto ancora non l’ho visitato. Sono stata due volte in Iran e sto già programmando il terzo round. Sono d’accordo anche sulla gente, che comunque mi ricorda molto gli Italiani.. I work at Persiatravelmart.com and we have been trying to change the image people have of Iran to a more positive one. Every week we have a story Friday, in which visitors of Iran post their experiences about the country, bad or good. We hope this will create a more realistic view people have of Iran.